Does More Diverse Plant Architecture in Pollinator Habitats Influence Native Pollinator and Beneficial Insect Abundance and Diversity? According to 2015 wild bee maps, key agricultural regions in the Western USA are at risk due to declining native bee populations coupled with a rising demand for crop pollination (Koh et al. 2015). These regions need to increase effective pollination habitat while not alienating farmers. Growers want to encourage pollinators but are hindered by lack of knowledge, limited time and labor, and the perception that pollinator habitat is weedy. This study has three main goals. First, exploring whether designing pollinator habitat to include plant species with divergent architecture increases native pollinator and beneficial insect diversity and abundance when compared to pollinator habitats containing species with similar architecture. This novel concept will expand research in the field and allow development of more effective multifunctional habitat. Second, evaluating ten economically viable crops, in this case cut flowers, for inclusion in pollinator habitat design based on their ability to attract pollinators and suitability to the Northwest. This will increase grower interest by providing an economic incentive to establish pollinator habitat. Third, encouraging growers to establish more pollinator habitat by developing farmer friendly pollinator plant groupings that are economically profitable, easy to maintain, inexpensive, and non-invasive. Education and outreach will include local farmers, western growers and pollinator researchers. For local farmers we will have a field tour and presentations on farmer friendly pollinator habitat. To reach out to nonlocal farmers we will develop webpages, an infographic and downloadable pamphlets on creating a habitat for wild pollinators in the Northwest. To further pollinator research we will submit at least one research paper on the effect of diverse plant architecture on native pollinator abundance and diversity. 1) Evaluate if a more diverse plant architecture influences pollinator and beneficial insect abundance and diversity (year 1-2). 2) Evaluate the suitability of ten different pollinator friendly marketable crops (cut flowers) for inclusion in pollinator habit (year 1-2). 3) Develop easy to establish, non-invasive, cost-effective and obtainable pollinator modules for western farmers (year 2). 4) Encourage adaptation of more effective pollinator habitat among local and regional farmers by developing and distributing educational material for growers on sustaining native pollinators (year 2-3). 5) Survey pollinator diversity and abundance on a WA certified organic farm (year 1-2). 6) Write and submit a research paper(s) on study (year 2-3). This study explores whether designing pollinator habitats to include plant species with divergent architecture will increase pollinator and beneficial insect diversity and abundance when compared to habitats containing plants with similar architecture. Plant architecture is the three-dimensional organization of the plant, including shape, size and position of branches, leaves and flowers. Different plant species can have similar architecture. A habitat diverse in terms of species can be similar in terms of architecture. The experimental design accounts for both species’ diversity and plant architecture. 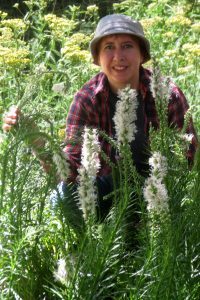 It will be conducted on a small organic farm near Colfax, WA owned by Jane Fluegel. The farm is surrounded by large conventional wheat farms. The area selected for the study is a very uniform, flat fertile field. Land will be prepared by tilling, measuring out plots, and laying down paper mulch and sawdust for weed suppression. We will use a randomized block experiment with five blocks and ten treatments. Treatments are designed to account for both plant diversity and plant architecture. The four selected plants are two pairs of non-invasive, commercially obtainable, pollinator friendly plants for the Northwest. Matched pairs are architecturally similar. The two different pairs are architecturally diverse. In addition, each plant will be evaluated separately. Each treatment will have 5 replications. Blocks control for time of insect counts. We can record insect visitors in ten plots at once. Each plant species will be evaluated 1) separately, 2) with an architecturally similarly paired plant species, and 3) with an architecturally dissimilar species (from the opposing pair). This design will allow us to evaluate whether changes in pollinator diversity and abundance are the result of the individual plant (one species in plot), species diversity (two species in plot with very similar architecture) and/or architectural diversity (two species in plot with widely divergent architecture). The ten treatments will be: SS, CC, LL, GG, SC, LG, SG, LC, SL, and CG. Treatments will be a 3 x 2 ft. plot with 6 plants randomly planted 12 inches apart. Plots will be covered with paper mulch and bark mulch to allow establishment without weed competition. Growers have enough to do without weeding pollinator strips. Full mulch will be applied in spring to reduce winter kill due to crown rot. Pollinator visitation and diversity will be assessed at least six full days for each treatment spaced out from April through August. We will use time lapse video camera surveillance. Edwards et al. (2015) demonstrated the effectiveness of portable time lapse video for pollinator counts. Time lapse photography will be scanned and pollinator and beneficial insects will be counted and identified. To conserve pollinators, pollinating insects will be identified in a non-interfering manner through photos. Periodic scouting will allow us to become familiar with regular pollinator visitors and to capture unknown insects for positive identification. Plant vigor and growth will be accessed each month during the growing season through height, foliage area cover and flower numbers. Treatments will be analyzed for significance using ANOVA. We will use a randomized block design with 10 treatments and 3 blocks. Plots will be 3 x 2 ft. with 5 plants placed 12 inches apart. Paper and bark mulch will be applied in early spring to prevent winterkill through crown rot. Pollinator visitation and diversity will be assessed on at least six full days within each treatment spaced from April through August using time lapse video camera surveillance. Time lapse photography will be scanned and pollinator and beneficial insects will be counted and identified. To conserve pollinators, most pollinating insects will be identified in a noninterfering manner through photos. Periodic scouting of the treatments will allow net capture of unknown insects for positive identification. Plant vigor and growth will be accessed each month from April through August through height, foliage area cover and flower numbers. 3) Develop an easy to establish, non-invasive, cost-effective and obtainable pollinator and beneficial habitat modules for western growers. We will use information from our research, as well as other expert resources, to design pollinator habitat modules specifically for the western US that can easily be used singularly or combined as strips or patches by growers. 4) Survey of pollinator and beneficial diversity and abundance on a Washington certified organic farm. Information we obtain from insect counts will be used to compile a survey of insect diversity and emergence during the growing season. 5) Encourage growers to put in more farmer friendly pollinator and beneficial insect habitat. This will include compiling information, taking plant and insect photos, and creating educational material specifically for growers on sustaining native pollinators and beneficial insects through low care, non-invasive, cost-effective, and economically viable pollination modules. 6) Write research paper on study. Analyze data and write up findings. We obtained 3.5” potted plants in mid-May. We immediately repotted all the plants in gallon pots using organic potting soil. Plants were cared for and watered during the hottest part of summer in preparation for fall planting. This is where Jane’s expertise in nursery plants came in handy. Since we started plants early, we will have large healthy two-year-old plants next year. See the size of our plants in the photo to the right (photo of Susan Fluegel with some of our healthy and beautiful potted plants in summer of 2018). After selecting our plant species, I realized that I had underestimated the space needed for mature plants of these large robust species. Since the plot size needed to stay small enough to position a camera over the plot and care for plants without stepping into the plot and compacting soil, I consulted Jane and adjusted the number of plants per plot. We reduced the number of plants in each plot to six plants per plot for the main experiment. The reduction in plant number per plot allowed us to use additional plant funds for the supplies and labor needed to repot plants and grow flowers to a gallon size. With this change to much larger plants we will get earlier and larger blooms and more pollinator data the first year. The area we are using for the study for study had slightly compacted soil covered with a few Canadian thistle patches and other hard to kill perennial weeds. From previous experience with killing these troublesome foes, we knew that solarization is a great way to control perennial weeds organically. The plot area was covered with tarps for 2 months from to kill the perennial weeds through solarization. After weeds were killed, the soil was spiked to reduce compaction, plowed and rototilled with a small 1950’s John Deere tractor. The spiking and plowing in of amendments took us a little more time than estimated but the great results were worth it. During tillage soil was amended with added horse manure and bark mulch to raise organic matter content, add nutrients and improve soil water holding capacity. Area was measured, plot squared and individual plots marked using 2-foot wooden surveyor stakes. Due to the number plants we selected and for ease of drip irrigation installation, plot size was three feet by two feet. Large, fully rooted gallon-size plants were planted one foot apart in the plots in late September. Susan, Jane, and our youngest farmers, Ollie and Annabelle, helped plant. Plants were lightly mulched for winter with bark. The light mulching was to avoid crown rotting due to excessive winter moisture on new plantings. This can be a major problem with fall plantings due to our rain pattern in the Pacific North West so we wanted to be cautious. All plots will have organic weed paper placed around the plants and full bark mulch as discussed in the grant placed down in early spring before weeds start to emerge. Plants had ample time to root before winter dormancy. As of early January 2019, experimental plants look healthy and viable. Any plants that winter kill will be replaced in spring (we purchased a few extra plants for insurance). Originally, we planned to mount the waterproof cameras on fence posts next to the plots. After some discussion we decided to build wooden frames so that the camera can be mounted above the plot. This will allow for a clearer view of the pollinators on the flowers and more accurate data. Right now we are just looking forwards to spring and all the beneficial insects it will bring! We are just starting our project and do not have results yet. We are just starting our project so have not reached most of this stage. However, two local large Colfax, WA wheat farmers, one Pullman, WA CSA grower, one WSU facility manager responsible for natural plantings on campus, and a small Colfax, WA organic grower have stopped to ask about our project (and why we have so many stakes in our field) and have been given short tours of the newly planted flowers along with a description of our project. All were interested in increasing pollinators and improving their habitat. The number of native pollinators and their importance. The variety of beautiful native plants suitable for pollination. We expect our project to contribute to future sustainability. This project fulfils the basic elements of sustainable agriculture. Studying ways to increase pollinator and beneficial insect numbers and diversity is economically viable, environmentally sound and socially responsible. Economic gains from pollination are greater than the cost of establishing suitable habitat. Promoting pollinators increases economic viability by improving crop yield, increasing crop marketability, and reducing fertilizer and pesticide inputs. Pollination increases crop quality by filling out fruits, vegetables and grains for larger, more symmetrical foods. Prettier crops appeal to the consumer and are more marketable. In addition, farmers do not feel the need to apply excess fertilizer or pesticides to robust crops. Yield increases coupled with greater marketability results in higher grower profit and greater local food production. Local food keeps money in the community and reduces food exporting costs. Promoting pollinator habitat is environmentally sound since it improves soil health, watershed quality, air quality, and wildlife habitat while reducing food transportation costs and emissions. Soil health is enhanced due to a reduced need for pesticides and the use of pollinator strips as windbreaks. Windbreaks improve crop production and increase air quality through dust reduction. Watershed quality is enhanced due to decreased contamination of water by fertilizer. In addition, perennial pollinator and beneficial insect habitats stabilize soil to eliminate runoff and combat soil erosion. Air quality is enhanced due to decreased soil erosion by wind. Wildlife habitat is enhanced due to the dual purpose of land set aside for pollinator habitat. Increased local food production reduces the fuel use and emissions associated with transporting food. Enhancing pollinator habitat is socially responsible. Pollination research helps keeps food affordable for all income groups due to increased production and reduced costs of production. Thriving pollinator communities are a valuable resource for future generations. Bees inspire art, poetry, science and research into flight and biosensors (Bromenshenk et al. 2015). A local CSA grower from Pullman, WA stopped by our farm late in August 2018 and admired our blooming plants. We explained our pollinator research to her and gave her a tour. She thought it was an excellent idea and expressed her willingness to help if we needed additional workers or researchers. She also expressed a desire to grow similar pollinator patches on her farm and was very interested in finding out which plants attracted native bees best.